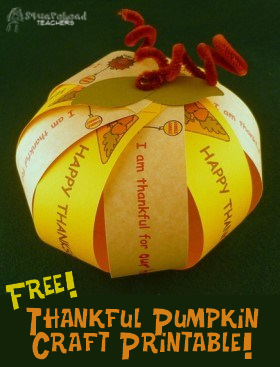 I saw this cute “Thankful Pumpkin” paper craft idea (source) and wanted to make some printables to go with it. 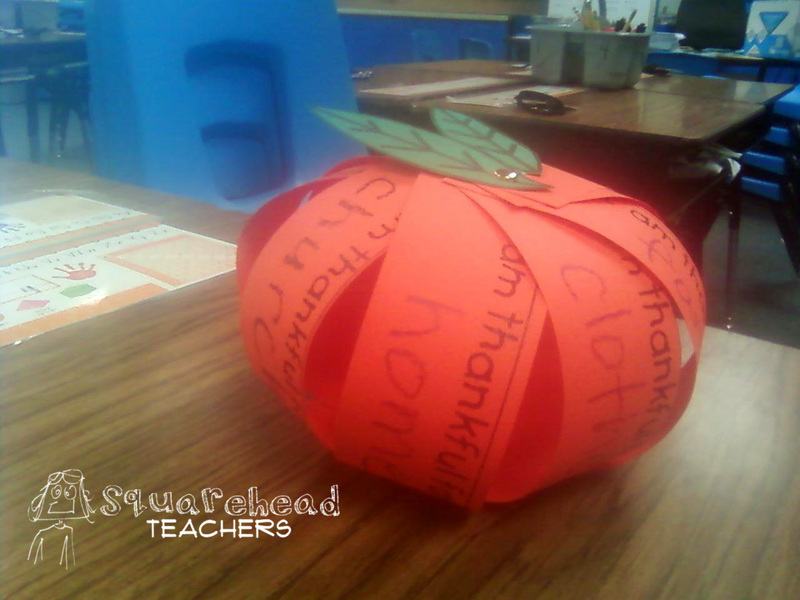 I love the idea of helping kids remember what they’re thankful for. Activities like this are perfect opportunities to talk with kids about how blessed we really are! 1. After you print the two printable pages, cut them into strips (cut on the lines). 2. Finish writing the “I am thankful for” phrases on 5 strips of cardstock. 3. Decorate the “Happy Thanksgiving” on the other 5 strips. Get Creative! 5. Stack the paper strips alternating the “I am thankful” and “Happy Thanksgiving”. 6. Stick the prongs of a brad through the holes on one end of the stack with the metal circle of the brad resting on the side with the writing. Secure Brad. 7. Fan out the slips with the writing side facing the table. 8. Pull up one strip and feed the prongs of the 2nd brad through the hole with the metal circle resting on the blank side of the strips. Continue putting strips on brad going in a circular pattern. 9. When all of the strips are on the brad and you have formed a ball, secure the brad by pushing the prongs down in opposite directions. 10. Cut 2 leaf shapes from the green construction paper. Poke a small hole at bottom of each leaf. 11. Wrap the brown pipe cleaner around a pencil to make a spiral shape. Gently slide the pipe cleaner off to keep spiral shape. 12. Lift up the prongs of brad, hold brad in place from below, and slide on leaves. 13. Place brown pipe cleaner next to prongs, push prongs down on top of pipe cleaner to securely attach the leaves and “stem”. This entry was posted in Art/Crafts, Holidays/Seasons, Thanksgiving/Fall, Writing, Writing Prompts and tagged Art/Crafts, Children, Education, Elementary School, Homeschool, Kids, school, Teacher Resources, Teachers, Teaching, Thanksgiving/Fall by Squarehead Teachers. Bookmark the permalink.